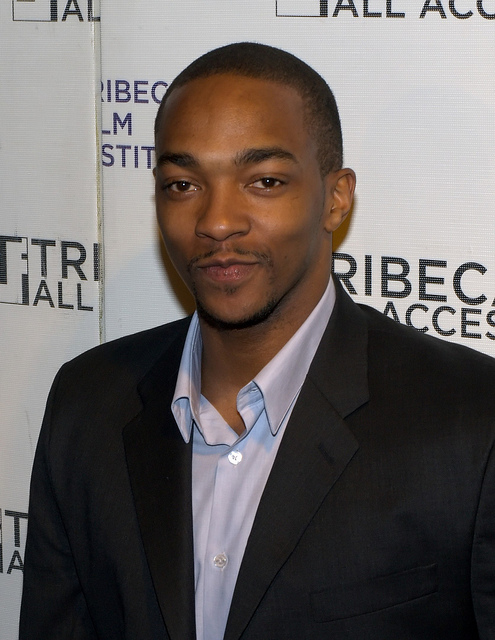 Apparently Anthony Mackie endorsed Donald Trump for President this week. Then, he said it was a joke. Then, we all asked “Why you always lying?” Mackie keeps putting his foot in his mouth where it concerns race, politics, and respectability. This is no different from what we have seen from the star before.Mackie has been in films like Adjustment Bureau (2011) and the Captain America franchise. He starred in Kevin Costner’s much maligned Black or White (2014) last year even amidst criticism that the movie was White Savior-ish. Now, the Our Brand is Crisis (2015) star is trying to draw attention to his new political film by endorsing hyperbolic Republican candidate Donald Trump. Shortly after Twitter began reacting to his words, Mackie took to Twitter to try to dismiss his comments as comedy. Sadly, no one found Mackie’s comments funny. Like, nobody. On both accounts, he was clearly advocating for a White supremacist mainstream and the notion that Black people should change their behavior and appearance to fit with White people’s expectations and preferences. We forgave him for that. But, now, he is trying to cement his position in the race draft with Don Lemon, Stacey Dash, Raven-Symoné , Pharrell Williams and Common by supporting a political candidate whose ideal America excludes anyone non-White, non-male, non-heterosexual, and non-rich. I still don’t know if this attention grab was genuine. I am tempted to believe it was. In either case, it is disappointing to continue to see members of the Black elite use their platforms for the perpetuation of harmful narratives about blackness in the United States. Granted, stars and starlets have an impetus to support an oppressive entertainment industry which is historically based on the exclusion of non-White artists. These entertainers function as both victims and gatekeepers in a system committed to limiting the media narratives of non-White people. But, regardless of that fact, many actors and actresses, producers, and directors of color have been trying to change that reality. Maybe this was just a hoax meant to get people to the box office to see Mackie’s new movie. Or, maybe he’ll will come around eventually. I won’t be holding my breath in anticipation though. I’ve learned enough from Black entertainers. No need to start expecting anything new from them now. January 21, 2013 Are You Watching the ‘Real Husbands of Hollywood’?